Sawgrass's ChromaBlast-R Cotton Transfer System / Ink a Threat to DTG? Several weeks ago Sawgrass announced the release of a new cotton transfer ink for Ricoh Printers called ChromaBlast-R. This announcement is a really interesting twist to the world of DTG and to the world of transfers. Of course Sawgrass had previously announced a solution for specific EPSON printers, but the inclusion of pigement ink for RICOH print engines gives them a strategic advantage. The reason for this is there are so many different brands of EPSON based DTG printers coming from Asia it is a challenge to understand which printers really work. Certainly from a channel perspective Sawgrass has a much better opportunity with the RICOH print engine, and we expect a more precise marketing message. 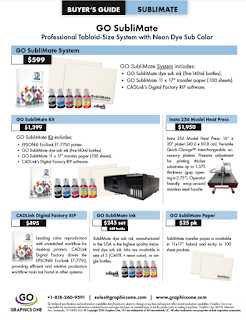 Here are some product details on the ChromaBlast R printer, ink and paper. As you will note above, the cost of entry for the RICOH system from Sawgrass is much lower by a factor of ten times. Whereas the everyday running costs of the RICOH may be a bit higher than the EPSON system, when all is taken into consideration the daily costs seem to be similar. With both systems there is no mention of printhead replacement costs. Our overall impression of the new product from Sawgrass, as compared to DTG is positive. We will address how the product compares to transfer printers, such as the GO UNO and OKI 920WT in a later post.